Yvonne is like mother Theresa with her warm personality and nurturing nature, her classes are like a fuzzy sweater that hugs you while you curl up on a couch....yeh, that's how to describe both our Mother Theresa at True Path and her Hatha based classes for beginners! Yvonne brings a sense comfort to each practice that is no doubt a natural for her. Trained with 200hr RYT Hatha, pre/ post natal, here in Stouffville. For Yvonne, yoga is an engaging and healing practice that captivated her the first time she stepped onto the mat. As a Register Nurse, Yvonne has a passion for teaching and nurturing which is no doubt why leading a Yoga class is so natural for her! As an avid cyclist, Yvonne has recognized the benefits of yoga for athletes and people with active life styles. 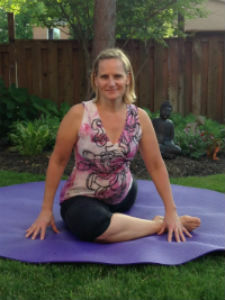 Yoga helps her to be more focused and bring awareness to the connection of body and mind while on and off her bike, and understands the benefits of Yoga aids in prevention and recovery of sports injuries as well as the aches, pains and stresses of everyday life that has become so common with many. In Yvonnes words, "I encourage everyone to participate in a regular yoga practice to strengthen and develop flexibility in everything we do."